Kicking off this week on Monday, Marine Le Pen wisely announced that she would distance herself from the racist past and reputation of her party by stepping down as its representative – temporarily – to run as an independent candidate in the French presidential elections, the final round of which will take place on Sunday May 7. Would this be interpreted as a bold, sincere move, a timely realization on her part of the toxicity of her party and family, or would it be dismissed as an opportunistic, hollow gesture? I was keen to find out. I fully expected the rolling news coverage here to be full of it the next day, yet there was hardly a peep. 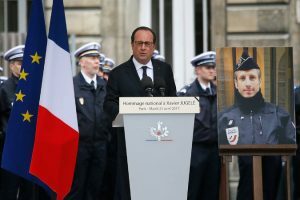 MSM was obsessing with the memorial service for the slain policeman Xavier Jugelé, who was shot on the Champs Elysees in last Thursday night’s suspiciously timed terror attack. It also provided photo ops for Le Pen and Macron, who quietly slipped into the outdoor service led by Francois Hollande. 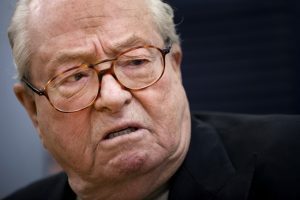 In fact, through Tuesday and into early Wednesday the MSM was discussing Le Pen in the context of ‘her party, the National Front’, even running an interview with her father (pictured), a boorish-looking bulldog type who earned the party its thoroughly racist reputation going way back. He would be highly toxic to her re-branding attempts. Was she being thwarted in the press? Well, it takes a seasoned politician to refocus the media spotlight in a positive way, which Le Pen succeeded in doing during Wednesday. 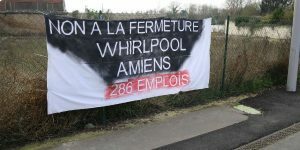 Wednesday saw both candidates rebrand themselves in the media with new slogans and glossy photos, but the centre of attention was the reception of both candidates by a group of protesting workers at the Whirlpool factory in Amiens (north of Paris, not far from the coast), which is due to move its manufacturing operations to Poland next year. 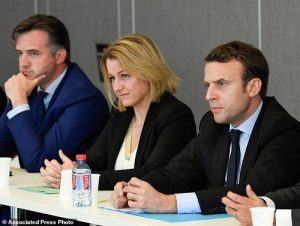 Macron’s campaign schedule had him holed up in a lengthy late-morning meeting in the Amiens Chamber of Commerce with management and union reps of Whirlpool. The optics were not impressive as he and two campaign colleagues sat on one side of the room facing a veritable lineup of Whirlpool management personnel on the other. (Online photos of this meeting show Macron flanked by an entire team but this is not what we saw in the continuous news coverage.) Macron looked stiffly appropriate in his dark grey bank manager’s suit, intervening symbolically in a situation where a factory is having to close down. Shades of his involvement in the selling off of French energy giant Alstom to GE in 2015. More of that in a moment. Macron incidentally hails from Amiens but had never visited the factory prior to today. His initial impulse was clearly not to meet with the workers affected. The workers protesting outside Whirlpool, with the unions in attendance, were clearly expecting him to come along after his meeting. Reporters were there in the carpark alongside the protesters with tensions running high. This promised to be a difficult confrontation for Macron given his globalist, neoliberal, pro-EU stance, as well as his history with Alstom. The selling off of Alstom to GE in late 2015 was a notch on Macron’s belt with the two-faced fake-left government of Francois Hollande. The previous minister of industry, Arnaud Montebourg, had been trying to get Alstom to stay in Europe by having Siemens purchase it; Macron was brought in to see the deal through, and it was he who let it be sold to GE making the ‘Schenectady-based GE Power GE’s largest unit, and a global powerhouse in the energy market, posting $7 billion in profit during the first quarter of 2017 alone.’ Little wonder that Macron is seen to put American corporate and banking interests ahead of French ones. So his anticipated arrival in the carpark of Whirlpool was bound to be fraught. But at 1pm, Le Pen just showed up at the factory out the blue surprising everybody including the MSM. 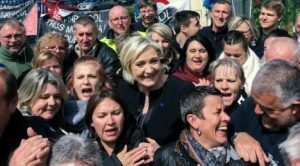 Le Pen was in her tactile element, smiling for endless selfies as the workers chanted ‘Ma-RINE! Ma-RINE!’. The images of the candidates presented simultaneously on rolling news coverage were, to say the least, contrasting. MSM pundits then estimated that ‘Macron must take a risk here’. So Thursday was billed as a day of revenge for Macron, who was due in the heavily working class, largely immigrant banlieu of Sarcelles, north of Paris, to earn his working class left-wing credentials. A suburb of immigrants from many cultures and languages, Sarcelles is a traditionally safe seat for whichever Parti Socialiste MP decides to run. TV coverage of his appearance showed Macron turning up at 4pm, when the kids were likely to be out of school. Flanked by ethnically-appropriate bodyguards in a concrete playground, he appeared with a group of 10 year olds who had been schooled to chant ‘Macron president! Macron president!’ He wasn’t allowed near too many members of the public, speaking to reporters through his security cordon. He hadn’t quite figured out that a business suit may not have been the wisest choice. It wasn’t an effective form of revenge. Le Pen began the day before dawn, going out on a boat with fisherman down in the southeast appropriately attired. Back on dock, she was genuinely glad-handing workers, railing on camera against the ‘ultra-liberalization’, deregulation stance of the EU, which she correctly identified as starting under Francois Hollande, to continue under Macron. As of Wednesday, protests were getting underway opposing the choice of BOTH candidates. 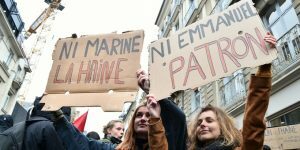 Using the ‘ni-ni’ formula – neither Macron, nor Le Pen – students from 20 Paris high schools were protesting on the streets Wednesday, and Thursday saw protests of a similar nature in other cities. However, I can report to you that this current of National Front fear/resentment/myopia is too strong for me to think that Le Pen will win: I have met so many people from across all boundaries who simply cannot, will not, ever vote for any Le Pen. Their dead ancestors practically forbid it. True, and French people are particularly resistant to new ideas as well as having their old ideas modified. It doesn’t matter how much you tell people that Le Pen is intelligent and capable of the flexibility necessary to rise to new circumstances, how she represents an anti-globalist paradigm that is in their best interests. It doesn’t matter if you point out racist responses from other parties and candidates (and boy, do they exist). Most of them are blindly fixed in their notions about a great many things and aren’t even very curious to know what key ideas like ‘globalism’ could mean. Le Pen has everything to play for, and even if she doesn’t win, her party stands to gain seats in the upcoming regional elections. In a way, it’s a win-win for her party given its traditionally marginal status. Let’s hope it will be a win-win for France. With Macron, this is highly doubtful. Pam Barker is the Director of the TLB Europe Reloaded Project, based in France. She has an extensive background in the educational systems of several countries at the college and university level as an instructor and administrator.